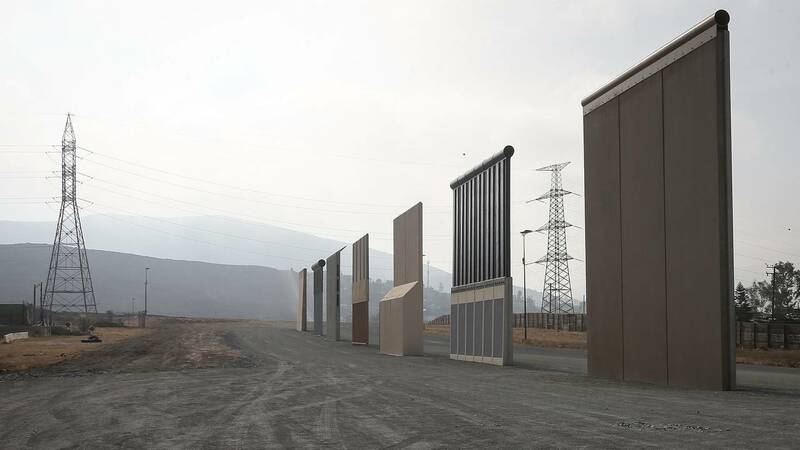 Obtaining funding is only half the fight for President Donald Trump to move forward with his signature border wall, as the administration is expected to face a slew of legal challenges that will likely draw out the construction of barriers. House Democrats are expected to sue if Trump tries to circumvent Congress through executive action or a national emergency declaration. Similarly, landowners along the border whose property is at risk of being seized to mount physical barriers could file suit. The spending bill Trump will sign, according to Senate Majority Leader Mitch McConnell, would include $1.375 billion for 55 miles of new barriers and a level of 40,520 beds for US Immigration and Customs Enforcement to detain individuals, short of the 52,000 the administration requested. Trump will also declare a national emergency when he signs the bill, McConnell said. House Democrats aren't expected to challenge any funds appropriated for the wall, but would likely do so in a scenario in which Trump uses executive authority, depending on what legal basis he uses. Speaker Nancy Pelosi said Democrats may try to sue. "I may. That's an option," she told reporters Thursday. In any challenge, House lawyers would have to establish that they have the legal right to sue in the first place. "The fact that Congress may be disappointed in something the executive branch does, would ordinarily not be enough to constitute an injury," said Peter Shane, a separation of powers expert at Moritz College of Law at The Ohio State University. Shane noted a decision rendered in 2015, however, in which a federal judge held that the then Republican-led House of Representatives had standing to sue the executive branch over a provision of the Affordable Care Act. Judge Rosemary Collyer of the United States District Court for the District of Columbia held the alleged spending of public funds that had not been congressionally authorized injured Congress by nullifying its power of appropriation. "In a potential judicial dispute over the wall, the Democratic-led House would argue that the Defense Department was undermining Congress' appropriations power by spending funds that had not been authorized for that purpose," Shane said. It would use the Collyer ruling as precedent. The House could also challenge Trump's national emergency declaration, though chances of succeeding are slim. They can argue, for example, that the situation along the border is not a national emergency, according to Robert Chesney, a former Justice Department official who teaches at the University of Texas at Austin School of Law. The definition of a national emergency, however, is vague, therefore it's largely up to the President's discretion. The follow-up then is whether the statutes that allow the President to dip into funds without congressional approval are properly invoked. "Is it the right kind of national emergency according to two funding statutes?" Chesney said. A draft national emergency proclamation reviewed by CNN last month cited Title 10 of the US Code, which allows Trump to unlock a stash of Pentagon funds that are earmarked but have no signed contracts for spending that money. That would give the President authority to pull from military construction funds and civil works projects, like infrastructure-repair projects. But Section 2808, specifically, requires the use of the armed forces. In that case, Democrats could point to what troops have already done along the border, much of which has been supporting US Customs and Border Protection, and argue that using the military isn't necessary, Chesney said. None of this is a guaranteed win for Democrats. "The truth is there's a well established deference to the executive branch," Chesney said. The only caveat, he added, is that the courts, under this administration, have been more willing to block the President's policies. Landowners have a greater chance at mounting a successful challenge, given that their property would be seized by the government to mount physical barriers along some areas of the border. "Only difference between (Democrats and landowners) is landowners can more quickly establish they have the right to be in court in the first place," Chesney said. All 55 miles included in the deal struck by congressional negotiators are in the Rio Grande Valley, according to a congressional aide familiar with the agreement. It's not clear how many of those miles are on privately owned land. Generally, the government is allowed to acquire privately owned land if it's for public use, otherwise known as eminent domain. The administration has conceded that this might be necessary in the past, both on CBP's site and in Justice Department job postings for attorneys qualified in "litigation of land condemnation cases." Landowners are often fighting for what is known as just compensation -- what they deem a fair price for their property. The significance of these cases became clear during the last government shutdown when the administration proceeded with a case to acquire nearly five acres of private land in Texas for the purpose of erecting fencing. The case, which dates back to 2008, involved defendant Pamela Rivas, who the government said is the "only party left in this cases to settle with" after at least a year of negotiations. Another family that also owned some of the land settled. That case is an example of just how long these cases can take. According to the Justice Department, as of last month, approximately 80 cases were still outstanding. In general, CBP is able to proceed with construction while lawsuits move forward. This story was updated after it was announced that Trump planned to declare a national emergency.